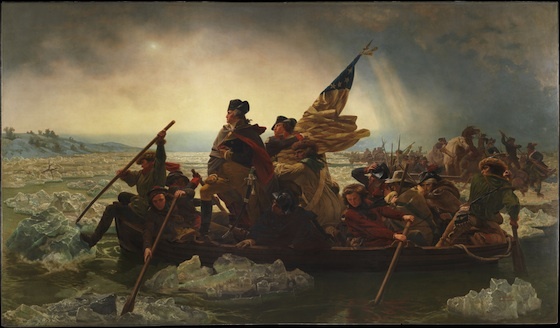 Washington Crossing the Delaware is one of the most recognizable images in the history of American art. You might be surprised, however, to learn that it was not painted by an American artist at work in the United States, but was instead completed by Emanuel Leutze, an artist born in Germany, and that it was painted in Düsseldorf during the middle of the nineteenth century. Leutze painted two versions of this painting. He began the first in 1849 immediately following the failure of Germany’s own revolution. This initial canvas was eventually destroyed during an Allied bombing raid in World War II. The artist began the second version of Washington Crossing the Delaware in 1850. This later painting was transported to New York where it was exhibited in a gallery in October 1851. Two years later, Marshall O. Roberts, a wealthy capitalist, purchased the work for the then-staggering price of $10,000. It was donated to the Metropolitan Museum of Art in 1897. It remained there until 1950 when long held curatorial concerns about its bombastic, crowd-pleasing qualities led the museum to send it to Dallas and eventually to a site near the actual river crossing. The painting returned to New York in 1970. Although Emanuel Leutze was born in Schwäbisch Gmünd, Germany, his family immigrated to the United States before he turned ten years of age. His first art instruction came in 1834 when he studied drawing and portraiture with John Rubens Smith, a London-born artist who worked in the United States during the first half of the 19th Century. Wealthy Philadelphian patrons recognized Leutze’s talent and sponsored the young artist to study at the Königliche Kunstacademie in Düsseldorf. 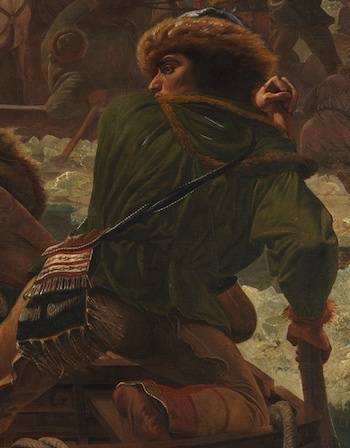 While there, Leutze came to know many American artists who were then studying in Germany. These artists included Worthington Whittredge, Albert Bierstadt, Charles Wilmar, and Eastman Johnson. 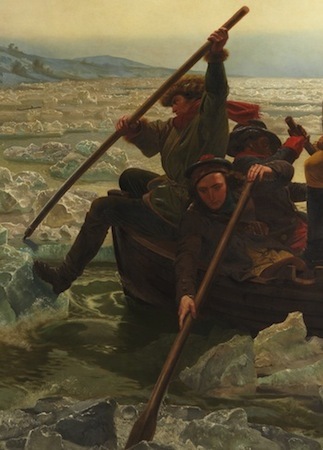 Although he was active in portraiture, Leutze’s fame today rests upon his history paintings, and among these, Washington Crossing the Delaware is the most recognizable and ambitious. It is, in one word, colossal, both in scale and patriotic zeal. Little can prepare a viewer for the experience of standing before a painting that measures more than 12 x 21 feet. 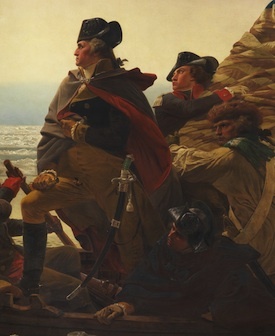 The monumental scale of the composition is matched by the importance of the historical event Leutze painted. 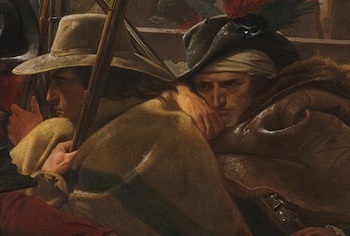 Without doubt, Leutze took his subject from one of the turning points in the American Revolutionary War. The Colonial cause appeared exceptionally bleak as the year 1776 came to a close. In a military move that navigated the fine line between brilliance and desperation, George Washington led the Colonial army across the Delaware River shortly after nightfall on 25 December in order to attack the Hessian encampment outside Trenton, New Jersey. Washington and his army achieved an unprecedented tactical surprise and delivered a much-needed military and moral victory. Washington’s army killed 22 Hessian soldiers, wounded 98 more, and captured more than 1,000 (Hessians were Germans soldiers hired by the British Empire). The Colonial Army had less than ten combined dead and wounded soldiers. After many military setbacks in the North, Washington’s bold move on Christmas night 1776 helped provide a sense of hope for the Colonial cause. In addition to General Washington, Leutze has filled the boat with a variety of ‘types’ of soldiers. Washington and his two officers are distinguished by their blue coats, the trademark attire of a Continental officer. The remaining nine men appear to be members of the militia. Three men row at the bow of the boat. One is an African American, another wears the checkerboard bonnet of a Scotsman, and the third wears a coonskin cap. Two farmers, distinguished by their broad-brimmed hats, huddle against the frigid cold in the middle of the boat, while the man at the stern wears the moccasins, pants, and hat of a Native American. This collection of people suggests the all-inclusive nature of the Colonial cause in the American Revolutionary War. Despite Leutze’s interest in history, there is little historical accuracy to be found within the painting. First, the “Stars and Stripes” flag shown in the painting was not in use until September 1777, and the size of the boat is far too small to accommodate the twelve men who occupy it. And although this event happened in the middle of the night, Leutze shows the crossing occurring at the break of dawn. Rather than depict the Delaware River, a waterway that was rather narrow where Washington and the Continental Army crossed, Leutze paints what appears to be a river with the breadth and ice formation of the Rhine. Finally, and perhaps most interestingly, Leuzte paints Washington standing upright, an unlikely and precarious posture for anyone in a short-walled rowboat. It is clear then that Washington Crossing the Delaware‘s strength is not in the correct rendering of an historical event. Leutze’s primary goal was to create a work of art that deliberately glorified General Washington, the Colonial-American cause, and commemorated a military action of particular significance. In doing so, Leutze created one of the most iconic images in the history of American art. Cite this page as: Dr. Bryan Zygmont, "Emanuel Leutze, Washington Crossing the Delaware," in Smarthistory, August 9, 2015, accessed April 20, 2019, https://smarthistory.org/leutze-washington-crossing-the-delaware/.